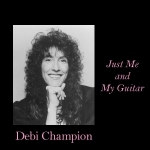 From Reidsville, North Carolina, Debi Champion began singing with cousins and friends in her home state, then as a solo performer and later with duo's and bands all over NC, SC, Georgia, Virginia, and Maryland. She then moved to South Florida in 1976. Debi's unique blend of country, rock, and jazz made her one of the area's favorite entertainers. In 1978 she won the Mark Allen Critic's Choice Award for "Best Female Vocalist" and in 1985 she won the South Florida Music Award for "Best Rock/Pop/Blues Female Vocalist". Debi has appeared in concert with such diverse artists as Spyro Gyra, Bob James, Leon Russell, Dan Seals, The Dirt Band, Gary Morris, Kris Kristopherson, Restless Heart, Suzi Boggus, Dave Mason, Marshall Tucker Band, Ronnie Milsap, Three Dog Night, The Bama Band, and Mark O'Conner. She also toured as a back-up vocalist with Miami Dolphin, Tim Foley, and sang with the Miami Symphony. Debi now lives in Kingston Springs, outside of Nashville, where she does demo session work, back-up vocals for different artists, and writes songs, some of which you may have heard on HBO or Showtime. She also serves as hostess for songwriter showcases every Tues, Wed, and Thurs night at the Commodore Grill in Nashville. She currently performs at the Commodore, the Bluebird, and at special events.